FACT CHECK: Is 'Amish Mafia' Real? Rumor: The reality TV series 'Amish Mafia' depicts the real-life exploits of Amish 'fixers' in Lancaster County. Claim: The reality TV series Amish Mafia depicts the real-life exploits of Amish ‘fixers’ in Lancaster County. Curious about that new show on the discovery channel “Amish mafia”. Seems to be conflicting info about whether is a documentary, entirely fictional, partially true, based on partial truth etc. the show itself seems pretty absurd, somewhat believable at times but more curious about whether such groups actually exist within the Amish world. Untrusting of outside law enforcement, some Amish in Lancaster County, PA have for many years regularly turned to a small organized group of men for protection and justice. Discovery’s new series Amish Mafia provides a first-ever look at the men who protect and maintain peace and order within the Amish community in Lancaster. while keeping the principles and morality within the community in check. Levi’s team is lean and fearless. Alvin is Levi’s right hand man and nobody gets to Levi without going through Alvin first. A lifelong friend, Alvin is at first glance an average passive Amish community member. However, he has a dark side, a past, and most importantly, Levi’s complete trust. Alvin will protect Levi at any cost. Other group members include Jolin, a Mennonite who serves as Levi’s foot soldier, and John, the youngest member of the group. As a non-Amish member of the group, Jolin has the freedom and ability to carry out punishments of all levels against offenders. John, the junior member of the group, is the son of the late former protector who maintained peace in the community for many years before Levi took power. John struggles with his desire to follow in his father’s footsteps and take Levi’s place as the head of the group. This is a side of Amish society that exists under the radar, and the Amish church denies the group’s existence. Amish Mafia provides eyewitness accounts of the incidents, misdeeds and wrongdoings within the Amish community, as well as a rare look at Levi and his team members who work together to maintain harmony. The truth of the events portrayed in “Breaking Amish” has been widely contested, and the veracity of this new show is likely to be the subject of just as much debate. The fictional vibe is reinforced by the clumsiness of the shakedowns, which seem stiff and awkward even for Amish country, and by the enthusiasm with which the four principals break the law on camera: shooting out a car window, cutting off a suspected adulterer’s buggy on the road and forcing their way into someone else’s motel room. “Mafia” is supposedly about protecting the Amish, but of course the primary victims here are the Amish. What little tension the series generates depends on portraying them as backward and helpless, and on playing off their reputation for simplicity and rectitude by depicting them as philandering frauds. There’s some low comedy in the methods the “mafia” employ, staking out a motel like B-movie private eyes and enforcing church rules against adultery as if they were a Muslim morality squad administering Shariah law. I’m a native of Lancaster County and have an extended family full of Amish people. If the Amish mafia were as vital to peace in the county as Discovery suggests, someone like me — especially with my youthful strays off the straight-and-narrow — would at least have heard of these gangsters, if not have had a few run-ins with them. 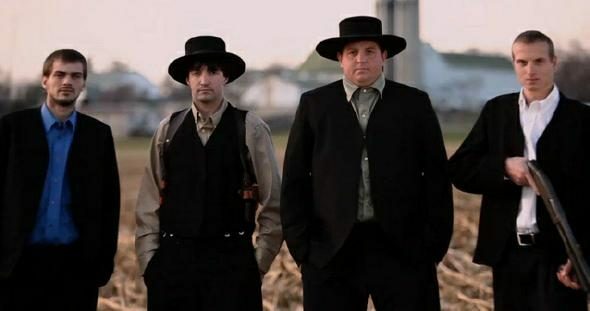 However, much as with “Breaking Amish” and other “Amishploitation” productions, the characters in “Amish Mafia” are misrepresented as having been plucked from the core of the Amish community when, in fact, the individuals involved are either on the outer periphery of Amish life, outright fabrications, or are vulnerable or classless enough to make for the kind of personalities TV audiences could find compelling regardless of religious or ethnic affiliations (the business of tabloid and reality television is premised on an ample supply of such people). In the case of “Amish Mafia,” thuggery and self-promotion certainly appear to be higher priorities of the featured “bosses” than the tenets of Amish religion. On the show: Levi is the leader with a criminal past who meets clients and other appointments inside a hay-lined barn office. His alleged rap sheet was displayed in the debut episode as proof. Reaction: Jeffrey Conrad, a local defense attorney and former prosecutor who has litigated “scores” of cases involving the Amish, said he asked his Amish connections directly about such a person. Reaction: Hard to dispute, there is no such thing. There is a Lancaster City Bureau of Police, but no countywide force. On the show: Members of the “mafia” are shown walking out of local stores tucking away envelopes of money, allegedly earned by protecting local merchants. Reaction: At least one local business depicted in the show says it just isn’t true. The business claims it never paid out protection fees. On the show: Claiming to be based in the heart of Amish country — southcentral Lancaster County — one scene shows characters John and Esther chatting on a river bank. Reaction: Locals are shaking their heads at this one, too. Many recognized the backdrop as a riverside park in Columbia, where the Amish population is next to nil. Not to mention, the location is on the county’s western edge, which would represent quite the hike in a horse-drawn buggy. As Elizabethtown College professor Donald Kraybill, a prominent researcher of Anabaptist culture, and others observed, genuine Amish folks wouldn’t appear on camera, as the faith forbids it. They are wrong. The only thing that makes this endeavor a “first-ever” is that it’s perhaps the most offensive production yet from Hollywood regarding Amish people, after a long litany of offenses, from “Kingpin,” “For Richer or Poorer,” “Amish in the City,” “Deadly Blessing” and “Witness” among many others. Unfortunately, this trend of Amish and Mennonite mockery is nothing new. Since their Christian faith doesn’t support “graven images” (see the Ten Commandments), and since the Amish prioritize humility and view pride as a threat to community harmony, you won’t see Amish spokespersons appearing before the press to defend their culture from a Discovery or Learning Channel attack. For Hollywood, then, they make for easy attack and a prime target.